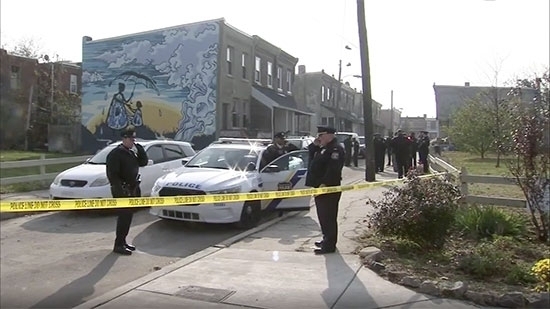 Philadelphia Police have charged one person and have two others in custody in connection to the quadruple murder in a basement in Southwest Philadelphia on November 19. 32-year-old Jahlil Porter, of the 200 block of East Ashmead Street, has been charged with murder, robbery and other offenses. The other two have not yet been identified. Police say that the four were shot because of a drug deal gone bad. Two of the victims, 31-year-old William Taylor and 28-year-old Akeem Mattox, had found a drug stash while renovating homes. They decided to sell it and set up a deal. However, the suspects came to the home with the intention to rob them. 20-year-old Tiyaniah Hopkins and 17-year-old Yaleah Hall were also killed. Police Commissioner Richard Ross said that the stash was small. "If, at some point, we are able to disclose that [value of stash], it's going to blow your mind how insignificant it was in the grand scheme of dealing with life and just how little these individuals had in regard for anybody else's life," the commissioner said. A New Jersey man has been charged with killing his brother and family before setting their house on fire because of a business dispute. He also set his own house on fire with his family inside to make it look like they were all being targeted. 51-year-old Paul Caneiro charged with four counts of murder, one count of aggravated arson, one count of illegal possession of a firearm and one count of illegal possession of a knife. He was previously charged with one count of second-degree aggravated arson for setting his own house on fire. On November 20, Caneiro allegedly shot his brother 50-year-old brother, Keith, outside Keith's Colts Neck home. He then went inside and shot Keith's wife, Jennifer, and then stabbed their children 11-year-old Jesse and 8-year-old Sophia. He then set fire to his brother's mansion. Prosecutors say that the crime was financial in nature. Paul and Keith Caneiro were partners in several companies including a computer business and a pest control business. Firefighters in Sea Isle City were battling a blaze that involved 3 buildings (6 total units). It started before noon on Thursday, 11/29, at 54th Street and Landis Avenue. The fire was sending a large column of smoke in the air and had heavy flames near the ground. One building is completely destroyed and the two other have suffered heavy damage. Three people have been injured, two were taken to the hospital. There is no word on what caused the fire.